You love our Hand-Cut Steaks, Fall-Off-The-Bone Ribs, Made-From-Scratch Sides, Fresh-Baked Bread, Ice-Cold Beer, and Legendary Margaritas. 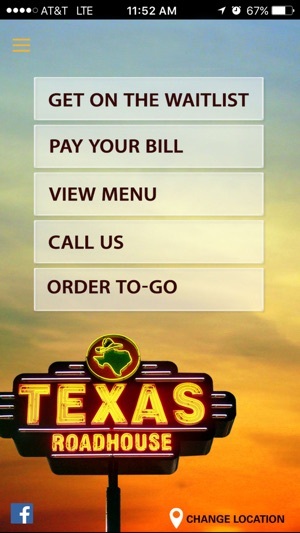 Now the legendary Texas Roadhouse experience is at your fingertips! 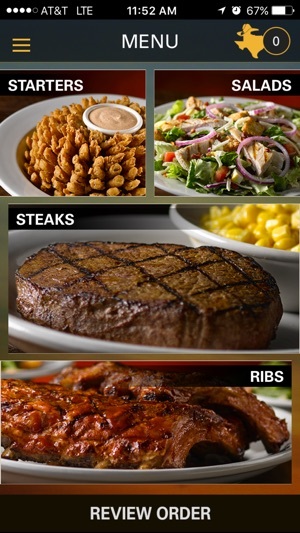 Download our Texas Roadhouse Mobile App to get on the waitlist in seconds, browse our mouth-watering menu, order to-go, pay your bill and much more. 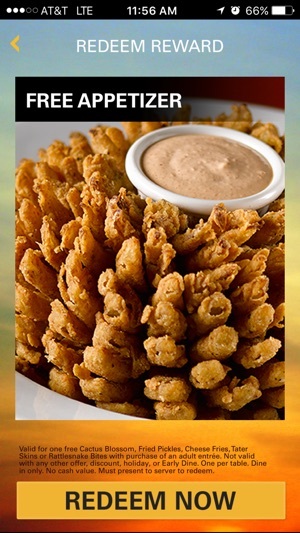 Plus, get your first reward when you download Texas Roadhouse Mobile and create your profile! I don’t know what the app developers were thinking – there is no box to make added notes. There is no way to order extra rolls. I always order two sweet potatoes rather than a salad but was unable to do so because there is no option to order more than one of anything per order. I would have had to place a second order then before us to pay extra. I may as well have just called the restaurant to place my order rather than be forced to place a wrong order. I also resent the fact that the app automatically adds on 18% for tip – I am not receiving tableservice thus an added 18% seems just a tad presumptuous. I think I will delete my app since it is useless other than to place a run of the mill exact order as listed. 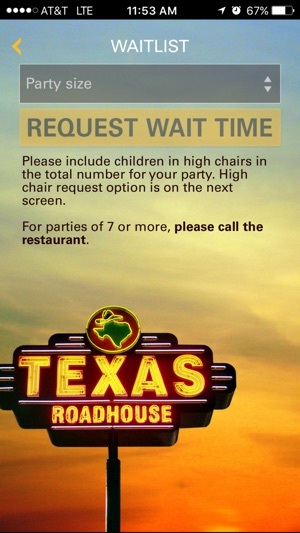 I am dumbfounded as to why the decision-makers at Texas Roadhouse did not see these issues for themselves – obviously they don’t eat at their own establishment or bothered to give their own app a try. Hi, we are so sorry to hear you experienced trouble and appreciate you bringing this issue to our attention. We understand that you had a poor experience and may not want to give us another try, but we would like the chance to make things right if possible. 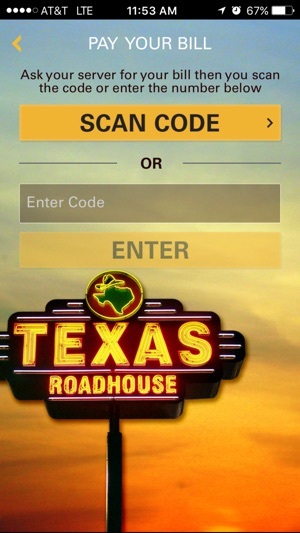 Please send us a private message at texasroadhouse@rlvt.net so we can look up your account and troubleshoot further. Thanks! Beware when you place an order to pickup in the restaurant. When you pay through the app, it gives you the after tax amount due. When you show up, the cashier looks up the order and confirms the amount. But when they print the credit card receipt for you to sign, when you look closely, a new line called “tip” has been added with an amount already printed on the receipt. The app never asks if you want to leave a tip. This has happened twice now, so it’s clear this extra charge is deliberately programmed into carry out orders. The only way to get it removed is hold up the line and wait for the manager to correct it. This is very sneaky and underhanded, and amounts to an unauthorized service charge on your bill. I’ve asked for an explanation and have not received one. I’ll give them three days and if I don’t hear from them I’ll delete the app. I may even report them to my country prosecutor for attempted theft. First review I have ever done for an app. First, despite me being able to enter the credit card info, it would not accepted the right type. Visa, MasterCard etc... Made sure I had the number correctly over and over, tried the different card types just to see if that window would go away. I ended up choosing to pay in store. All appeared to have worked, was given a time my order would be ready to be picked up confirmed. I did not get an email, checked junk folder, didn't get a text. Decided just to go at the scheduled time as it is not far and I figured if I had to wait for the order to be made, it wouldn't be the end of the world. It was not ready and they had not received the order. I certainly will not be using this app again, and frankly I don't think I would trust the website either. I suggested just calling to make your order.